Situation: Keys Dental is an independent dental practice in Perth’s northern suburbs, with a loyal customer base and a progressive approach to delivering dental care for patients of all ages. With a warm and inviting new practice, and with franchise dentist brands proliferating, it was time for the Keys Dental team – one of the biggest in the Perth region – to revitalise their brand and online presence. Deliverables: The Keys Dental management team engaged our freelance website copywriters to create the content for their new site, which was, in true Keys Dental fashion, all about putting patients first. Our goal was to demystify dental care and treatments and create a site that not only promotes the benefits of Keys Dental's patient-focused ethos, but educates visitors and allays the fears patients often have about visiting the dentist. Click to read our copywriters' work for Keys Dental in Perth. 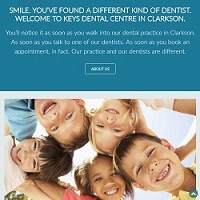 Result: The new website looks good and is packed with information that is both engaging and inspirational, much like the experience of visiting the dental team at Keys Dental. See for yourself. Find out more about our website copywriting expertise and check out more of our website copywriting work, or contact our website copywriters about your next web project.